University of Arizona Associate Professor of Physics Andrei Lebed has discovered that strong magnetism changes the basic, intrinsic properties of electrons flowing through superconductors, establishing an "exotic" superconductivity. "Understanding the physical nature of the electron pairs that define superconductors is one of the most important problems in condensed matter physics," Lebed said. He published the research earlier this year in Physical Review Letters. He said the work is one of his most important contributions to physics in his 20-year career. A Dutch physicist, Heike Kamerlingh Onnes, is credited with discovering superconductivity in 1911, work for which he was awarded a 1913 Nobel Prize. Kamerlingh Onnes' momentous discovery was that pure metals such as mercury, tin and lead become "superconductors" at very low temperatures. When cooled to near absolute zero temperatures, certain conducting metals suddenly lose all electrical resistance. At zero electrical resistance, the metals will conduct electric current endlessly. Physicists began winning Nobel Prizes for pioneering theory to explain the phenomenon of superconductivity a half century ago. In 1957, American physicists John Bardeen, Leon Cooper and Robert Schrieffer proposed a comprehensive theory to explain the behavior of superconducting materials. The theory, called "BCS theory" for the scientists' surname initials, was the first great insight, the first big step in understanding superconductivity. The work garnered them the 1972 Nobel Prize in Physics. Cooper had discovered that electrons in a superconductor don't act as individual particles, but as pairs, now called "Cooper pairs." When electrical voltage is applied to a superconductor, all Cooper pairs move as a single entity, establishing an electrical current. When the voltage is cut off, the current continues to flow indefinitely because there is no resistance to the Cooper pairs motion. This normally works only at very low temperatures. When the superconductor warms up, its Cooper pairs separate into individual electrons and the material becomes a normal non-superconductor. 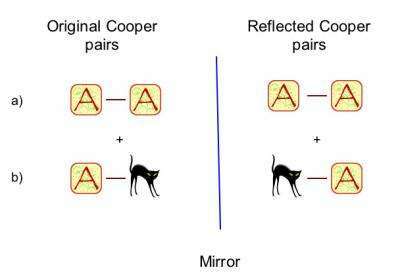 "People always have thought about the Cooper pair as behaving as an elementary particle, which is characterized by size (or, roughly speaking, the average distance between the electrons in a Cooper pair), electric charge, spin, mirror reflection and time-reversal properties," Lebed said. Contrary to this commonly held theory, Lebed said, "We show that superconducting electron pairs are not unchanged elementary particles but rather complex objects with characteristics that depend on the strength of a magnetic field." Some background to understand how this works: American physicists David Lee, Douglas Osheroff, Robert Richardson and Anthony Leggett won Nobel Prizes in Physics in 1996 and 2003 for their theoretical and experimental studies of rotating Cooper pairs in helium-3. They discovered that electrons in a Cooper pair, no matter how far apart they are, have either conventional "singlet" or unconventional "triplet" internal rotation, or "spin" in quantum physics jargon. When the spins of the two electrons are in opposite directions, one spinning up and the other spinning down, they are called singlets, or non-rotating Cooper pairs. When the spins are in same direction, they are called triplets, or rotating Cooper pairs. Lebed has now discovered that super-strong magnetic fields create exotic Cooper pairs that behave according to the weird, non-intuitive laws of quantum mechanics: the electron pairs are both rotating and non-rotating at the same time. They behave kind of like microscopic "quantum mechanical hurricanes," as UA Regents' Professor Pierre Meystre, head of UA's physics department, put it. Another unexpected and unique magnetic field-dependent property is mirror reflection. Because Cooper pairs are quantum objects, they behave both as particles and as standing waves. One standing wave property is mirror reflection, or "parity." Physicists earlier found that wave symmetry in conventional, or singlet, superconductors is even. It is mathematically termed as +1. They also discovered that unconventional, or triplet, superconductor parity is odd, or - 1. When singlets or triplets are reflected in a mirror, the reflected waves always have the same (+1) or opposite (-1) parity of the original waves. Lebed finds that in strong magnetic fields, Cooper pair wave symmetries break down. The reflected waves don't look like the original waves. "It's like the Cooper pair wave sees someone else in the mirror," he said. "It's like Alice's adventure in a super-wonderland, where the mirrors are unusual and wrong." "Because these Cooper pair electrons behave so differently than conventional singlet and unconventional triplet Cooper pairs, we call them 'exotic' Cooper pairs," he said. UA physics graduate student Omjyoti Dutta and Lebed are now collaborating on more detailed theoretical studies of exotic superconducting phases. They have very recently discovered that "time-reversal" symmetry also breaks down in exotic Cooper pairs. Time reversal symmetry is the idea that most fundamental physical laws would not change if time ran backwards instead of forward. "This is the most fundamental symmetry in physics and breaks down only in some rare processes in high energy, or elementary particle, physics," Lebed said. But the UA physicists find that time-reversal symmetry is broken because of the simultaneous rotating and non-rotating average spins of exotic Cooper pairs. "Half of the exotic Cooper pair electrons 'see' time directed from the past to the future, whereas the other half 'see' time directed from the future to the past," Lebed said. "It's important to note that our theoretical results are very general," he said. "They are based on a mathematical theorem and have to be experimentally applied to most kinds of existing superconducting materials, including high-temperature superconductors." The UA physicists are designing simple experiments for observing exotic superconductivity. "We hope that our discovery of the exotic behavior of superconductivity in high magnetic fields eventually improves our understanding of how to most efficiently produce strong persistent currents in superconductors," Lebed said. Superconductors are sought by energy, transportation, medical and computing industries. More practical, affordable superconductors would be a boon to power utilities that would realize enormous savings in more efficient systems for generating and storing electricity, to the transportation industry which is experimenting with trains that float above their tracks using superconducting magnets, to medical technologists who are developing improved magnetic resonance imaging, and to the supercomputing industry that seeks very fast electronic switches needed to build "petaflop" computers capable of performing a thousand-trillion floating point operations per second.